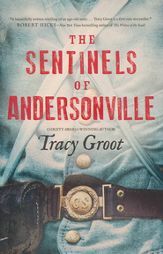 The Sentinels of Andersonville is a book that will make the reader explore a variety of emotions. Tracy Groot writes a book so powerful and impacting, it should be in every history class across America. Until I’d read the book, I’d never even heard of Andersonville and now it’s a place in history, I’ll never forget. Taking from actual historical events and combining them with a fictional story of several brave men and women, Tracy Groot tells the tale of Lew, Dance and Violet, just to name a few. When Emery Jones and Lew Gann find themselves at a standoff, they start talking. They talk themselves right into a friendship, although it’s quickly ending as Emery must arrest Lew and take him to Andersonville. Thinking the rumors cannot possibly be true, Emery is aghast when he delivers Lew over to Andersonville. Though a huge area, the ground is packed with starving, dying men…thousands of them. At that moment, Emery regrets following his orders and vows to free Lew, somehow, someway. The Sentinels of Andersonville is a book that has forever changed me. It raises questions beyond my reasoning of how something so atrocious was allowed in America. But the story must be told and Tracy Groot does a fantastic job of doing so. This is an absolute must read. This book is so powerful no, it’s beyond powerful…it’s haunting.